Cheers to your next release! The blog hop sounds fun — I love that question! Great blog post – I added the book to my Goodreads Shelf. Congratulations on your new book, Jamie! Good luck with everything! I you need another place to land for your blog tour I am making myself available. Jack would be so proud, Jamie 🙂 Here we are at a blog fest and here I am blog fest challenged. All signed up! Congrats on your new book! YAY! So glad you’re participating! Congratulations on your new book! I’ll go sign up for the blog fest. Congrats on your second book release coming up so soon. I always love the 2 truths and a lie icebreaker. Sounds like fun. Hi Jamie I just want to let you know that I just put the journals in UPS. They should arrive on January 27. For some reason it won’t let me from my phone. I’ll sign up tomorrow from my laptop. Promise! Awesome! Just added it to my GR list. And the blogfest sounds like so much fun! 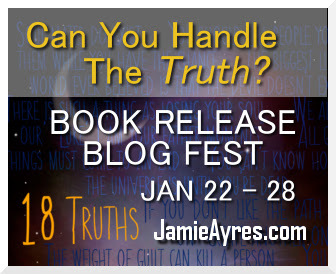 This is such a great way to celebrate 18 Truths! I just signed up, and can’t wait for the games to begin! Pingback: Animal Stories – Can You Handle The Truth?